Simone Pinet received her PhD from Harvard University. 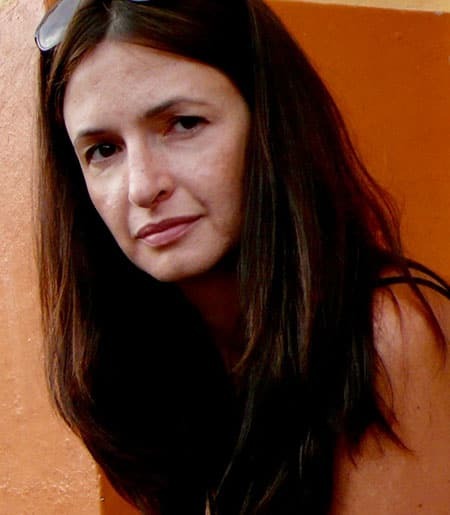 Her teaching and research focus on medieval and early modern Spanish literatures and cultures, from the thirteenth through the sixteenth centuries, especially in relation to spatiality, economics, poetics, and translation, with an eye, especially in her teaching, to the long-term connections between the medieval and the modern, both in contemporary Spain and Latin America. Related areas of interest include visual studies, cartography, and political economy. Her book, Archipelagoes: Insularity and Fiction from Romance to the Novel (University of Minnesota Press, 2011) examines literature and cartography in Spain in the transition from the medieval to the early modern through the figure of the island. A second book, The Task of the Cleric (University of Toronto Press, 2016), takes the thirteenth-century Libro de Alexandre as a focal point for the discussion of cartography, translation, and political economy in different archives and texts. She is currently at work on a book on economic metaphors and rhetorical strategies traced through canonical works of the Iberian Peninsula from the thirteenth through the fifteenth centuries. Prof. Pinet was a fellow of the Society of the Humanities in 2008-2009, and a John S. Guggenheim Foundation Fellow for 2010-2011. Archipelagoes: Insularity and Fiction in Medieval and Early Modern Spain (University of Minnesota Press, 2011). Courting the Alhambra: Cross-Disciplinary Approaches to the Hall of Justice, coedited with Cynthia Robinson (Brill: Leiden, 2009). El baladro del sabio Merlín: Notas para la historia y caracterización del personaje en España. México: JGH, 1997. Bibliotheca Litterarum Humaniorum, Krinein, no. 2. “The Chivalric Romance in the Sixteenth Century.” In A History of the Spanish Novel. Ed. J.G. Ardila. London: Oxford University Press, 2015. “Between the Seas: Apolonio and Alexander.” In In and Of the Mediterranean. Medieval and Early Modern Iberian Studies, edited by Michelle M. Hamilton and Nuria Silleras-Fernández, Vanderbilt University Press, 2014. “Los tapices de la Historia de Amadís de Gaula,” in Amadís de Gaula: 1508 (quinientos años de libros de caballerías), Madrid: Biblioteca Nacional de España/Sociedad Estatal de Conmemoraciones Culturales, 2008 [October 9, 2008-January 19, 2009], 403-405. “Literature and Cartography in Spain: Etymologies and Conjectures,” in The History of Cartography: The Renaissance, vol. 3, part I. Chicago: University of Chicago Press, 2007, 469-476. “Where One Stands: Shipwrecks, Perspective, and Chivalric Fiction,” special issue of e-Humanista 16 (2010): 381-394. “Towards a Political Economy of the Libro de Alexandre,” in Theories of Medieval Iberia, special issue of diacritics 36.3 (Fall 2006): 44-63. “Para leer el espacio en el Poema de Mio Cid: breviario teórico,” La corónica, Vol. 33.2 (Spring 2005): 195-208. “On the Subject of Fiction: Islands and The Emergence of The Novel,” in Robert A. Davidson and Joan Ramon Resina, eds., New Coordinates: Spatial Mappings, National Trajectories, special issue of diacritics, 33.3-4 (2003): 173-187.